Pair of Powered 2-Way 10inch Floor / Stage Monitors Wedge Style with Titanium Horn - 250 Watts RMS - PA/DJ Stage, Studio, Live Sound Active 10 Inch Monitor - MODEL: SA-10MT-PWCONTENTS: 2 Powered 2-Way 10inch Wedge Monitor, CONDITION: New, APPLICATION: PA Floor Monitor , WOOFER: 10inch Loud Speaker with 40 oz Magnet and 2inch Voice Coil, POWER: 250 Watts RMS; 500 Watts Peak, FREQUENCY RESPONSE: 48 Hz - 20k Hz, SENSITIVITY: 93 dB, CONNECTORS: Two Line Input/output - XLR Combo / Male XLR - 3.5 mm Input, IMPEDANCE: 8 Ohms COVERING: Black Carpet with Black Metal Corners, ENCLOSURE: MDF, with 5/8inch Plywood Front Panel, DIMENSIONS:18.25inchx13.25inchx15.5inch, WEIGHT: 35 lbs per Cabinet, WARRANTY: One Year Warranty, SPECIAL FEATURES: Can be Daisy Chained - 3 Band EQ - Treble, Mid, Bass, Power Select 110V or 220V Power Supply, Gain Control / Volume Control - MIC/LINE Changeover Switch. 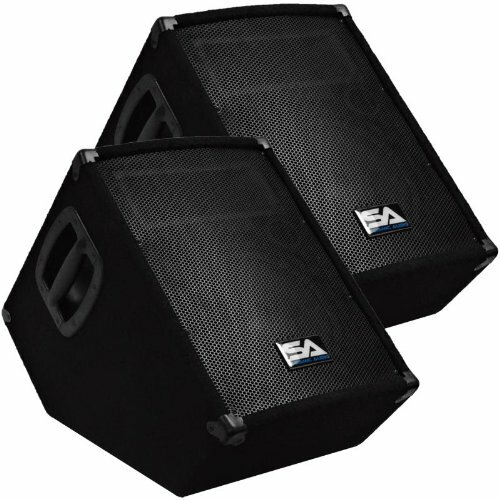 The Seismic Audio PW series of Powered / Active Monitors are ideal for any PA application. Whether you are doing live sound, in the studio, an MC, a DJ gig, or karaoke...The ability to hear yourself on stage is essential. These Powered Monitors come with a built in 3 Band EQ! These active monitors are versatile as well, plug in a dynamic microphone or MP3 player and BAM...instant PA system! These 10inch Active Monitors operate at 250 Watts RMS and are perfect for all small venue applications! The MT Powered Monitors are loaded with all the features of the big name products, without the big name price! QSC K8 2-Way Powered Speaker - 1000 Watts, 1x8"